Most people are familiar with the common Hall's honeysuckle (Lonicera japonica), which has white fragrant flowers and climbs on anything it touches. 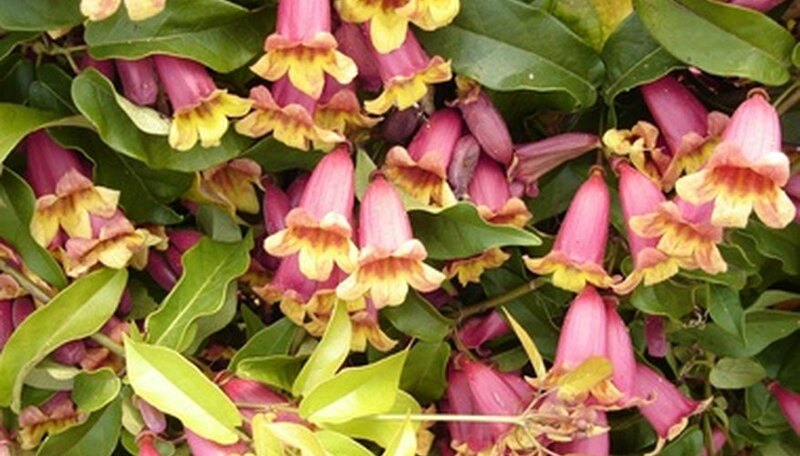 But there are many other honeysuckle varieties to try, including shrub varieties (Lonicera tatarica), and trumpet honeysuckle (L. sempervirens), which bears red, trumpet-shaped flowers followed by red berries. Honeysuckle grows in most soil conditions and is hardy to USDA Plant Hardiness Zone 4. It grows so well that it can become invasive. Honeysuckle is afflicted by several diseases and insects, some of which are difficult to control. Identify the problem by inspecting the plant. Aphid infestation causes the leaves to curl and discolor. Dormant side shoots sprout in response and become infected, as well. The plant forms a dense, matted growth of dead stems. Leaf blight, the most serious disease of honeysuckle, turns leaves yellow, then brown. The leaves curl and die. Additionally, the undersides of the leaves have a white layer of fungal growth. Treat an aphid infestation by applying a systemic insecticide containing acephate to the plant. Because the aphids live inside rolled leaves, most topical insecticides won't reach them. Treat leaf blight by spraying the plant with a fungicide, such as mancozeb, following package directions. Prevent future problems by planting honeysuckle with at least 12 inches between plants and away from other shrubs. Good air circulation prevents many disease problems. Water honeysuckle early in the morning so the leaves dry quickly. Pick off any aphid eggs that you see on the leaves or stems of the honeysuckle plant before they hatch. Plant honeysuckles in full sun for maximum bloom. Honeysuckles grow in part-shade, but may not bloom much. Fertilize honeysuckles in early spring and then again mid-summer with a granular 10-10-10 fertilizer if the plant's growth seems slow. Apply according to package directions around the base of the plant, taking care not to get the fertilizer on the plant's roots or stems. Manage aggressive honeysuckle vines by pruning them back to the ground each winter with pruning shears. Give them a sturdy fence or support to climb on and don't grow them near shrubs or trees, as they may strangle other plants. Dig up and remove any honeysuckle that are damaging other plants or structures. Water honeysuckles to keep them evenly moist. Spray minor insect infestations with a soap spray, following package directions. Don't fertilize a vigorous honeysuckle or its growth may become rampant.